The image depicted by the Eight of Wands means that the difficulties that were brought by the Seven of Wands are finally over. It signifies a strong level of energy which states that different aspects of your life will be trailblazing. Perhaps important news will be coming on your way, and you may experience a sudden, yet steady positive growth. The Eight of Wands meaning may also pertain to your work. There is a chance that the decision that you are waiting for will come your way soon. You need to be patient and just wait for it. Perhaps important news will be coming on your way, and you may experience a sudden, yet steady positive growth. When it comes to love, the eight of wands meaning pertains to your readiness to be committed on a relationship; however, the card advises you not to force the other party to also be ready on the commitment. Your significant other will soon be ready - forcing things to happen may affect the result negatively. In terms of finances, it appears like this is not the best time to make hasty investment. Just like in your love aspect, we advise you to be patient. Save your money and wait for the perfect time to invest. All things that you fought for are building in momentum. Where you didn't see progress earlier, you'll soon discover that they paved the way for the coming wave of action. 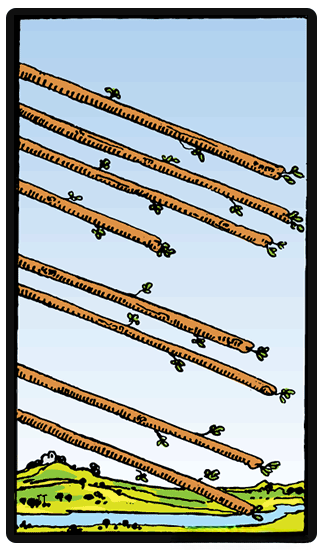 Just like the upward Eight of Wands, the Eight of Wands reversed meaning is generally associated with patience. There is a possibility that you are feeling frustrated about something. You might now see that what you set in motion earlier created the obstacles that you are discovering right now. It is time for you to understand that you cannot change the past. You must forgive yourself, and adapt your strategy. In terms of work, there may be an existing disagreement in your office. You need to settle this quickly in order to avoid derailing any major issue. Breathe, think and try to relax. Be patient and believe that everything will be just fine. The Eight of Wands reversal meaning on love may pertain to possible jealousy. The jealousy that you are feeling right now has no basis and will just affect your good relationship with your partner. In the aspect of Health and Spirituality, you need to improve your focus, cooperation, and determination. The energy of the card will just dissipate if you are losing your focus.